A couple weeks ago, we looked at some vintage embroidered handkerchiefs and discussed how to tell the difference between hand embroidery and machine embroidery on vintage pieces. Today, we’re going to look at another vintage handkerchief, embroidered in a style that can only be hand embroidery. It’s a monogrammed hanky with (ahem…) an M. Needless to say, I don’t mind the M! In fact, I’m kind of partial to the M.
Don’t be fooled by the gold-ish color of the embroidery. What you’re looking at is whitework embroidery, worked in white thread, but the threads are discolored from age. Strangely enough, it’s only the thread that’s discolored – the fabric itself is still white and does not show the same degree of discoloration. Parts of the embroidery, too, are not discolored. And even more strangely, the embroidery is unevenly discolored. In some places, the discoloration starts on one thread and continues in a small space, and then the thread returns to white. Looking at the back of the work, there is no evidence that there was any change of thread – so the discoloration is indiscriminately blotchy. And I like the tag! In the mid-1900’s, the Carol Stanley Studio of New York designed ladies’ accessories like scarves and handkerchiefs, some of which were hand embroidered, often in Switzerland. The line was sold at fine department stores like Lord & Taylor. 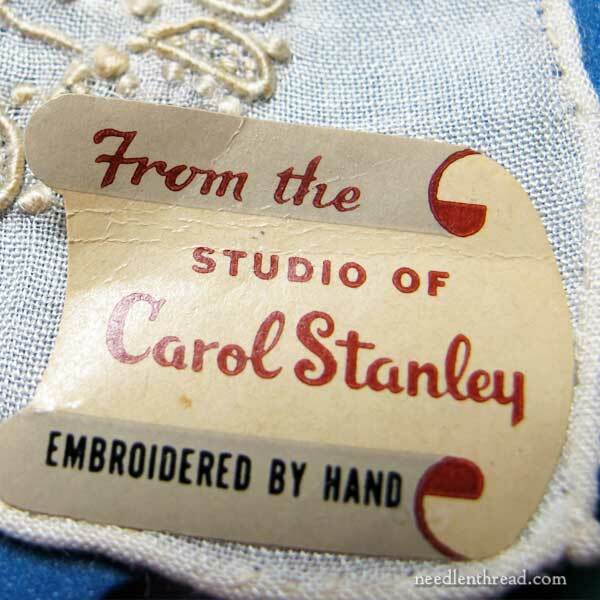 You can, incidentally, find old advertisements for Carol Stanley Studio’s hankies online in some vintage publications. The Carol Stanley hankies, depending on the type, ran anywhere from $1 – $2, which would be the equivalent, today, of about $10 – $20. To get some perspective on spending a whole dollar in 1950, I talked to my mom and dad. That was the year my mom’s dad died, and that fall, at 16, she got her first job. She made about $4 a day, working 8 – 10 hour days. So, to spend $1 on a hanky – especially when you could buy one for 10 cents at the dime store – would have been considered Pretty Ritzy! Even without the tag, though, we can tell that this monogram is definitely hand embroidered. The technique – which produces a very smooth, almost cord-like appearance on the surface of the fabric – is a form of satin stitching, specifically called trailing. Trailing is satin stitching over a string or a group of strings. It’s a gloriously gorgeous technique when done well. 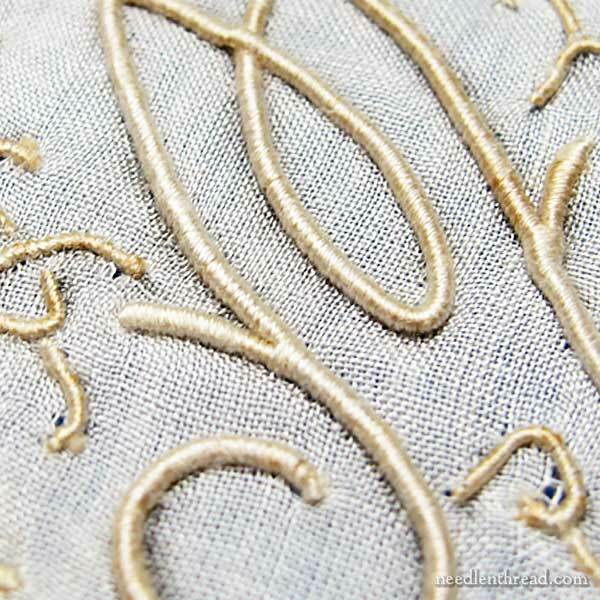 It’s often used for hand embroidered monograms and it shows up in whitework quite frequently. If you’d like to see a good explanation of what trailing is and how it is done, you might check out Tracy Franklin’s series on her Crathorne Bug project, and specifically, this article about trailing. I do love these lovely vintage handkerchiefs, which were a gift from Jane, a reader here on Needle ‘n Thread. There are so many treasures among them, and I love reading their stories! Timely post! I have a trailing piece in mind, although so far, it’s a vague idea that I haven’t worked out in detail, yet…and I’m not going to tempt myself with it until I get caught up on the other SEVERAL works I’ve got going now! years ago on Usenet on RCTN, there was discussion about this type of random staining. Many people believed it came from using saliva to control the threads when threading them into the needle. I don’t think anyone did a scientific sample to test this, but it did seem to fit well with some of the randomness In the staining. What a lovely piece of history, I love it! There is no way I would attempt cleaning it, but I like the look of an old piece of embroidery that shows age. And that tag is timeless! I have never tried cleaning embroidery though, so I don’t really know how. Thank you for sharing this! I would enjoy a tutorial video teaching how to trail. What a beautiful piece of work. I remember RCTN! I was a lurker on RCTN, I’m glad some else remembers it! The “discussions” on licking yea or nay, mayo vs miracle whip, the actions of some designers. Not to mention the projects and the progress, the annual JCS ornament issue, DMC and some of their floss colors changing when they changed to a less toxic formula….. I still pop in every few months, it’s a sad shell of what/who used to post. Wasn’t there also instances of the quilting thread turning brown, and it was discovered that the quilter was a chewing tobacco user? Regarding the handkerchief, what about exposure to sunlight or skin oils/makeup, laundering products, etc? It looks like the threads are either rayon or silk based only on how shiny they are. Might they change color differently than the fabric? Sorry for the rambling trip down memory lane. HI, Gail – the threads are cotton. The shine is due to the mercerization, and the fact that it’s a softly twisted thread, so you really get a good sheen with satin stitch. It’s not as shiny, actually, as the photo looks, I suppose. That’s probably a bit of over exposure from the shot! How pretty! I would never do this on a hanky, or use one that had this kind of embroidery. It is too pretty — but it is also too textured to soil with something so mundane as, well, you know. But it is pretty. Thanks for sharing. I think Marjorie is right. Professional seamstresses never used saliva to thread the needles when sewing whites ( my mom’s experience). It was known that with time the saliva soaked thread will turn yellow and the fabric will look stained. Since saliva is organic material that is now embedded in an another organic material – it is going to be interesting to see how you clean it. My first impulse was to soak it in dilute white vinegar (acid to break the proteins from the saliva) – but I am not an expert in anything fabric or cleaning. Still, it is a beautiful piece, and worth more than $20 for the amount of work it required. A lovely monogrammed piece of embroidery. The trailing lines are interesting as it lifts the piece above the fabric which gives a nice affect. The tag is a little bit of history and I like it. The history of the piece and the Company is very interesting I should imagine these pieces were made for richer people who could afford such luxuries. What a lovely gift as you love vintage embroidery pieces. I do hope the cleaning of the piece is successful, do let us know how it goes. Thanks for sharing this timeless piece of monogrammed embroidery and for introducing historical embroideries of the past. Mary, Could the storage method be responsible for the discolorations? Well, the storage situation could have something to do with discoloration, but in this case, I’m guessing not. The discoloration is blotchy all across the piece, and chances are, the way it was stored was not quite that erratic. I’m thinking it has something to do with something coming in contact with the thread while it was worked. Oil on the hands…who knows? my Mum always said a lady had two hankies in her handbag – one to show and one to blow :). This gorgeous hankie is definitely in the “show” category. Loved this article, it brought back memories of the work my grandmother did. I have a couple of pieces. This one is just beautiful. Thanks for sharing. yes, my question was whether it was cotton or silk. IF silk, i know that the (untreated) threads will sometimes return to their original cocoon color. I have an 1830’s wedding dress with patches of all shades of ecru because of this. But cotton poses a different situation. I wonder what is in the core of the trailing. That would be yet another variable. It is a beautiful specimen! I find the stories of the handkerchiefs quite interesting. 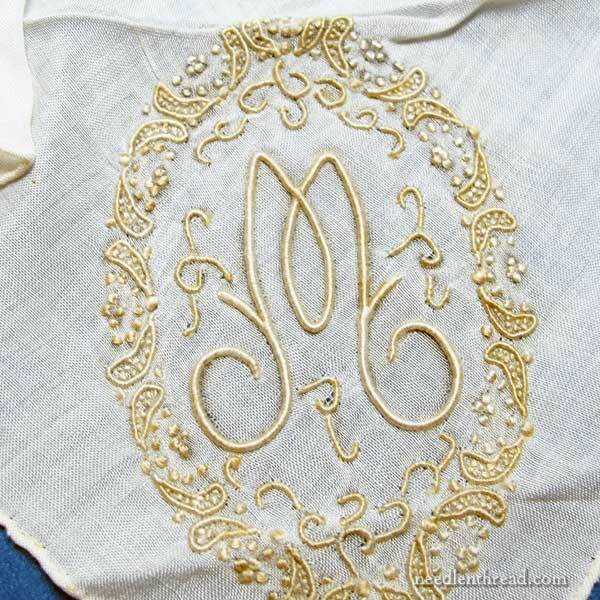 I like fancy handkerchiefs, especially the ones with cutwork borders and/or whitework designs. Do you think that maybe you could do a tutorial on trailing for us? It seems like it would be a Very Useful Thing in Hand Embroidery. I was wondering if the discoloration might come from storing the piece in newsprint or some other acidic paper. Variations in the amount of contact could account for the color differences. An interesting article. I’d never heard of trailing, but it reminds me of casalguidi. Thanks for giving background on the company as well, and the blog link demonstrating the technique. Times have changed a lot, from delicate squares to paper tissues.